Trevor Noah addresses the audience during the Oct. 16 taping of “The Daily Show Undesked Chicago 2017: Let’s Do This Before It Gets Too Damn Cold.” Throughout the week, Noah and the show’s correspondents covered topics including gun violence, racial segregation and the latest headlines about President Donald Trump. CHICAGO – When “The Daily Show with Trevor Noah” needs a white male’s point of view, it turns to correspondent Michael Kosta. 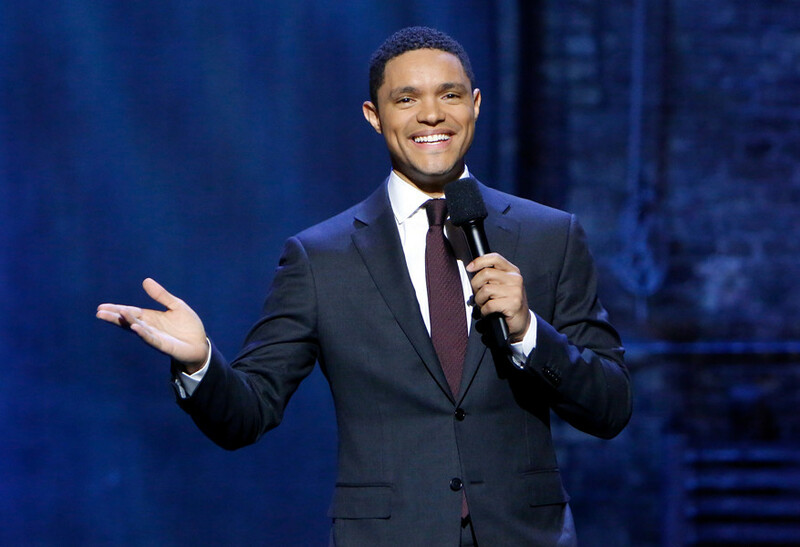 In addition to Noah, the South African and Swiss host who took over in 2015, the current cast of “The Daily Show” includes six correspondents: a black woman, a white woman, a Muslim man, a Malaysian-born Chinese man, a black man and Kosta. With the likes of Desi Lydic, Ronny Chieng, Roy Wood Jr. and Dulcé Sloan signing on as correspondents during Noah’s tenure, “The Daily Show” has officially become one of television’s most diverse late-night comedy series. In a November 2015 interview with NPR, Noah said he was “very conscious” of comedy’s lack of diversity, and wanted to “correct it” by finding people whose talents have been overlooked in the past. Chieng told The Daily people look to the show’s cast to address content affecting a variety of diverse communities. “Just seeing a different face talking about anything makes people go, ‘Oh, at least they know that there’s people there who look like me, who talk like me or who think like me,’” he said. The diverse mix of correspondents also helps determine what stories are pitched during meetings and whether a segment accurately represents the views of the demographic it focuses on, Chieng said. Sometimes in meetings, a cast member will vocalize a misinformed opinion on an issue affecting a minority group, Chieng said. But because “The Daily Show” has correspondents from various backgrounds, they can ensure these groups’ beliefs are accurately conveyed. She told The Daily that the show is able to cover topics in an “authentic and honest” way because of its cast. She said other, less diverse shows may miss out on this opportunity and that Noah has played a big part in expanding the issues discussed during the show. A day before starting to tape “The Daily Show Undesked Chicago 2017: Let’s Do This Before It Gets Too Damn Cold,” Noah graced the stage of Cahn Auditorium to participate in a talk sponsored by The New York Times. Noah addressed a full house, discussing how he navigated racial divides as a biracial man in South Africa and, later, in the U.S.
Noah approached the Chicago episodes through a similar lens, as he and the show’s correspondents covered topics including gun violence, racial segregation and the latest headlines about President Donald Trump. Communication senior Halle Lukasiewicz, who worked on the Chicago show, told The Daily that Noah’s mixed ethnicity influences his work and distinguishes “The Daily Show” from other late-night comedy shows. In front of a set designed to look like CTA tracks, Noah taped the Chicago series without a signature prop: his desk. Leaving the New York studio for the first time this year, “The Daily Show” relocated to the Athenaeum Theatre in north Chicago to record the four-part series. Noah interviewed famous Chicago natives such as rappers Common and Vic Mensa, former Education Secretary Arne Duncan, former street gang leader-turned-activist Curtis Toler and actress/writer Lena Waithe, an Evanston Township High School graduate. Mensa, a biracial artist who was featured in the series’ final episode on Oct. 19, shared his experience growing up on the South Side of Chicago — which he called a “hotbed” of culture. He, like Noah, said he didn’t understand the concept of race until he was 11 or 12 years old. “As police were singling me out and treating me differently than my white counterparts in our transgressions, I started to realize the world had decided for me and that I was branded,” he said. In light of the “fear” people are feeling across the world, Mensa said his new album, “The Autobiography,” tries to break down barriers between people and spread empathy. The album, he added, is an attempt to bring individuals to the same “human level,” where everyone experiences the same basic emotions. Mensa also commented on race relations in Chicago. He said black rage was “engineered” due to the city’s history of redlining, faulty loans to minorities and the creation of “projects” in black neighborhoods. This past, he added, has bled into present-day Chicago life, which is often misrepresented. Chicago native Camiah Kincaid, who attended the Oct. 19 taping featuring Mensa, told The Daily she was glad guest speakers addressed the reality of racial tensions. As someone who also hails from the South Side, Kincaid said Mensa’s views resonated with her. Kincaid said she’s been a fan of the show for years — even before Noah became the host — and feels it “took a good turn” under the South African comedian. Part of what makes the show relatable is its diverse team, said Hector Adames, a professor at the Chicago School of Professional Psychology who was also at the Oct. 19 taping. Adames told The Daily the show creates a space in which people of color — like himself — can deal with “oppression” and serious current events through comedy offered by people who look like them. Smyser said diversity in entertainment and news has only recently started to gain traction. Kosta, one of the correspondents, said the show has benefited from its team members’ diverse viewpoints. He added that it is a “smart move” for a show’s cast to come from different backgrounds. In the 2015 NPR interview, Noah added that wanting to make change and actually doing it are two different things. So, after receiving only a handful of applications from black comedians for “The Daily Show,” Noah went out and looked for them himself. When the host signed off on Oct. 19, he advised audience members to do something similar in their own lives.